Vietnam is a country that is overflowing with natural beauty. It is not surprising that the number of tourists visiting Vietnam is increasing every year. For a first time traveler to Vietnam there are many things you should know. Read on to find tons of tips detailing how to travel to Vietnam safely and without problems arising. Your Passport. And that it is valid for at least 6 months following your date of entry into Vietnam (No temporary passport is accepted). Blank Pages: Double check that your passport has at least 2 blank pages. Next you should check if you need a visa for Vietnam or not. A simple way to do this is by checking the list of travelers eligible for Vietnam visa exemption here. Applying for a visa at Vietnam embassy/consulate abroad. This is acceptable for both a business and a tourist visa. Obtaining a visa on arrival into Vietnam while still in the airport. Again, this is acceptable for both a business and a tourist visa. Applying an e-visa for Vietnam before you leave. There are quite a few stipulations for applying online which include tourist visas only, 30 days max, and single entry only. 80 countries can obtain a visa this way. A passport valid for at least six months following your date of arrival in Vietnam. The passport cannot be not torn or blurred and must have at least two blank pages. A completed application form for Vietnamese visa. A copy of the papers proving the purpose of entering Vietnam. The visa fee paid at the Embassy/Consulate as prescribed. The approval letter (which can be applied online in advance via a visa center). The documents will have no visa stamp, you will get the stamp upon arrival at a Vietnam airport. Read on: Here is a more in-depth article explaining how to get a visa on arrival to Vietnam. Option 2 is very convenient and simple but you must keep in mind that it is for those traveling to Vietnam by air only. Obtaining a visa for Vietnam online is incredibly simple but, as mentioned above, you cannot get a work visa this way. The online option is for tourists only. The visa will also only be valid for 30 days max, and allows single entry only. 80 countries can obtain a visa this way. Scan of your passport page and soft copy of your photo for online application at https://evisa.xuatnhapcanh.gov.vn/. QR code of your e-visa paper which is the print-out of your approved application. Limiting contact with children on the street that you do not know is the most useful advice for visitors. These children are not only lottery ticket sellers or street vendors, but also “professional” pickpockets who are very good at their job. In fact, there are many tourists who have lost all their property because they are not careful with these children. When you travel to Vietnam, you need to be extremely aware of your surroundings. Always be on the lookout for strangers following you. If someone is following you or acting suspicious , it’s best to find a way out of her/his sight or to find help. Step inside a coffee shop or into a store with many people. If you are going to the beach or hiking in the mountains, leave the valuables at home. Make use of the safe inside your room, or in the case of extreme valuables ask the reception desk to hold onto them. Extra money and cards should always be hidden in many different spots inside your luggage. Never leave everything all together. It is best to store any valuable items in different places. Using public transport in strange places is also a matter of concern for tourists. Do not assume that a taxi is the safest vehicle. When you do not know the local language, it is best to ask an airport security officer or hotel receptionist to find a reputable taxi company. Usually they can call one for you and negotiate a price ahead of time. To be even more cautious, take a photo of the taxi license plate and driver's license card to message to loved ones back home. This is worst case scenario though and only if you feel as if you are in a bad situation. 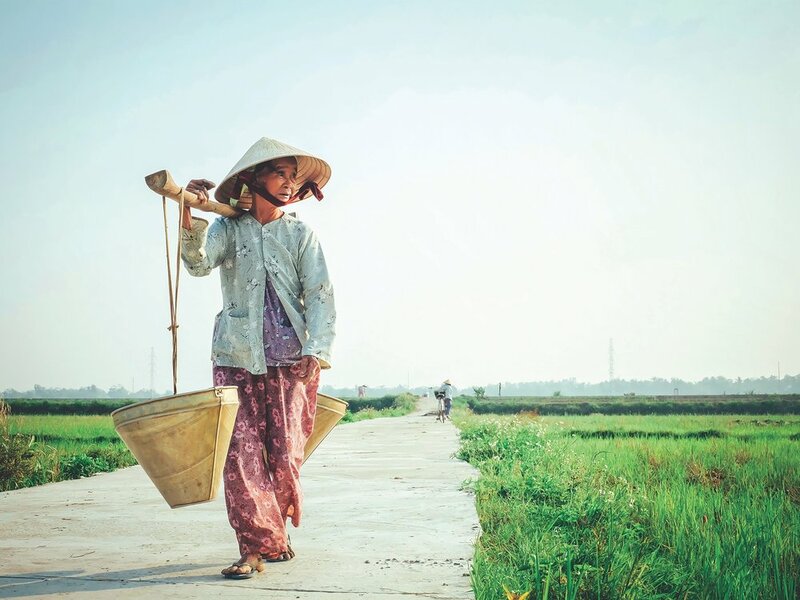 Because of geographical differences, as well as culturally differences and language barriers, many Western tourists often think it will be difficult to communicate in Vietnam. The good news is most travelers are really surprised to find most locals speak a bit of English. Certainly in big tourist spots and enough to get by. The EF English Proficiency Index (EF EPI) published by EF Education First in Hanoi on November 14, 2018, showed that Vietnam is in the average group of English proficiency, reaching 53.12 EPI points and ranking 41st out of 88 countries and territories. The assessment reports on five central cities, including Hanoi, Ho Chi Minh City, Da Nang, Hai Phong, and Can Tho. Last year, Vietnam achieved 53.43 EPI points, ranking 34th out of 80 countries and territories. According to the report, from 2011 to present day, Vietnam had a clear growth in English proficiency level. In 2018 especially, Hanoi and Ho Chi Minh City have the best English proficiency. If you are traveling to Vietnam, you can rest assured you will run into few language barrier problems. It is always a good idea to learn some common phrases before you go to any country. It shows you are trying to learn and grow from your travels. Even being able to communicate with the local people a little bit will help you earn respect and admiration. The State Bank of Vietnam is the only agency to issue money of the Socialist Republic of Vietnam. The monetary unit is "dong", the national symbol for money is "d", and the international symbol is "VND". When tourists exit and enter Vietnam they should be aware it is unlawful to carry more than USD $5000 with you. This applies for other foreign currencies of equivalent value. You may also not enter or exit with more than VND 15,000,000. ATMs in Vietnam are available in many places and withdraw cash when you need. I will advise not to carry too much cash at once or to flash a lot of money around while in Vietnam. The unwanted attention could result in theft. To exchange money head to the nearest bank. Tipping is not mandatory in Vietnam. You’ll find most items extremely inexpensive, in fact, Vietnam is rated by tourists as one of the cheapest in the world. With this in mind if you want to add a small tip on top of common service you’ll find this is highly appreciated. Some restaurants, especially on the higher end, will add 5% service fee to the bill. If service is good I would add 5-10% more on top. Customers at bars should a bit extra or simply round up the total bill. Taxi drivers will, of course, be happy to keep any extra money, but it is not expected. Internet in Vietnam is pretty fast compared to other countries. Speeds can sometimes even be equal to Google Fiber you would find back home. Vietnam has taken many steps to develop their Internet from dial-up to copper and now to fiber. Internet is available everywhere in Vietnam. You can easily find a free Wi-Fi hotspot in many hotels, restaurants, cafes or libraries. If necessary, you can also register for 3G service. Buying a SIM card in Vietnam is also very easy. You will see advertisements for it everywhere and you can easily find a new SIM at any mobile store. The price is about 100.000VND which is about $4 USD. Vietnamese electricity is a 2-pin round socket with a 220V voltage. Don’t forget your power converter. Planning a trip to Vietnam, and Asia in general is overwhelming. Everyone has an opinion on this beautiful location of the world. Rest assured that no matter what you choose to do or where you choose to stay you'll have a beautiful time. Also, a super common question I get is: What camera do I use for my travels? The main camera body is a Nikon D5600. With that I use the kit lens and a Sigma wide-angle lens, which I am genuinely obsessed with. Every travel photographer needs one to take your photos to the next level.